One of the most overdue inductions into the WWE Hall of Fame will be remedied this year as WWE has announced that the legendary Rock “n” Roll Express (Ricky Morton and Robert Gibson) will join Kurt Angle in the 2017 class. 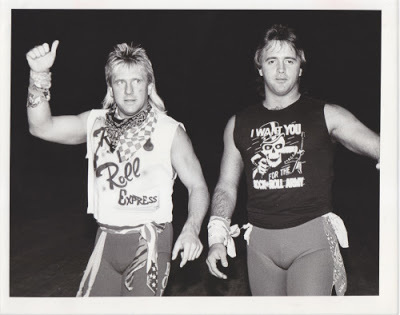 If you were a wrestling fan in the 80s, you undoubtedly knew the popularity of Ricky Morton and Robert Gibson; from multiple title reigns to wild female fans, the Rock n Roll Express were huge stars especially in the NWA. Their feuds with the Russians, Four Horsemen, and of course The Midnight Express are bits of history that could never be recreated. The fact that the “Rock ‘n’ Rolls” would also be huge singles stars as well is another factor that made them such a memorable team – especially Ricky Morton who had an absolutely electric feud with Ric Flair in 1986. Morton has also been referred to as one of the best “storytellers” ever in the ring, and is a regular reference point to anyone trying to teach the younger generation about having truly great matches. The Rock “n” Roll Express represented what was so great about wrestling in the 80s – the diversity. If you didn’t want to cheer the team that all the ladies were going crazy for, you had so many other options and they were all different – but the thing was, even though The Express had the girls going wild, they still came off as two tough guys that weren’t afraid to step into the ring with anyone. Ricky Morton and Robert Gibson didn’t end their careers in the 80s though – after their NWA glory years you may have seen them in the AWA, Memphis, TNA, and even WWE at different points. The duo actually even made a cameo as recent as the last couple of months on Impact Wrestling during the Hardy Boyz’ “Total Nonstop Deletion” episode and the duo continues to step into the ring even today. It’s great to see WWE making sure that the legendary talents that aren’t in their Hall yet are making it in slowly but surely; here’s to hoping we get a Rock ‘n” Roll Express collection on the WWE Network as well as new merchandise, action figures etc. because Ricky and Robert are most definitely deserving!